The most famous card reader during the Napoleonic era was Marie Anne Lenormand. Until recently, use of the Lenormand divination cards was confined to Europe, but not now. Suddenly everyone wants a deck and everyone wants to know how to read them. In these two master classes, Caitlín Matthews explores the history, future and practice of Petit Lenormand card methods. Much has changed since the first early 19th century explosion of parlour oracles took traditional European piquet cartomancy by storm into so many different directions. We are now experiencing a second awakening as Petit Lenormand cards invade the rest of the world. 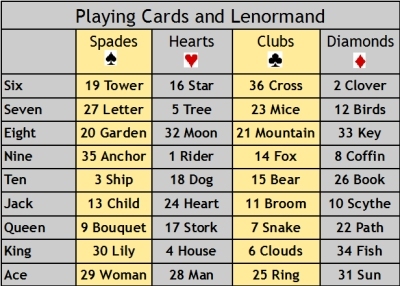 Here we explore the context, history and impact of Lenormand cards as well as how we shape and become part of their future through our practice. Here we look at the origins and cartomantic development of the Petit Lenormand cards and the piquet deck that preceded them, as well as exploring the reasons why Marie-Anne Adelaide Lenormand’s name became so strongly attached to them. We hear about her life, adventures and divination methods. Using the traditional parlour context, we will practise classic cartomantic skills such as pairing and counting with our cards, and the art of tableau. 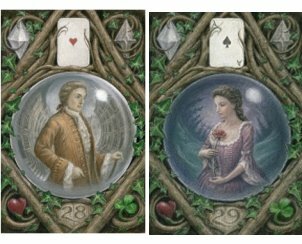 Here we look to the future of Lenormand Cards as the cards’ popularity spreads out beyond Europe. As personal ambassadors of this tradition, we are in the process of extending our own divinatory range and Lenormand vocabulary to the world about us. We see how each card can also be a person and an event, and how we create our own colloquial vocabulary as we update the Lenormand dictionary. We explore the literal and metaphorical impact of the cards, and learn some smaller spreads to use on a daily or weekly basis. 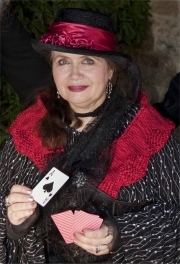 “I have studied and taught many aspects of the Western Mysteries for over 30 years, including ancestral ritual, shamanism, and divination, including reading the omens in nature, to many kinds of early cartomancy, and also tarot and Lenormand. I am the author of 67 books which include Enchanted Lenormand Oracle (2013), The Complete Lenormand Oracle Handbook (2014,) and have created four tarots and five oracles. Together with John Matthews & Felicity Wombwell, I am the co-founder of The Foundation for Inspirational and Oracular Studies (FIOS) which spotlights the oral and sacred arts that often become sidelined as unimportant: we annually host exemplars of these sacred arts to teach in UK. Supporting traditional skills and methods of divination is very important to me and I am very fortunate in having so many colleagues throughout the world who share this interest and pool researches. I am the owner of two original mid-19th century Lenormand decks, including the Belgium Daveluy and the 46 card Austrian Zauberkarten, and am fascinated how variant Lenormand and small oracles cross-fertilized each other. Video recordings of the two classes are available – one as a Windows Media file and the other as an MP4. They can be viewed on PCs using Windows Media Player and on Macs using the free VLC multimedia player for Mac operating systems which can be downloaded here.